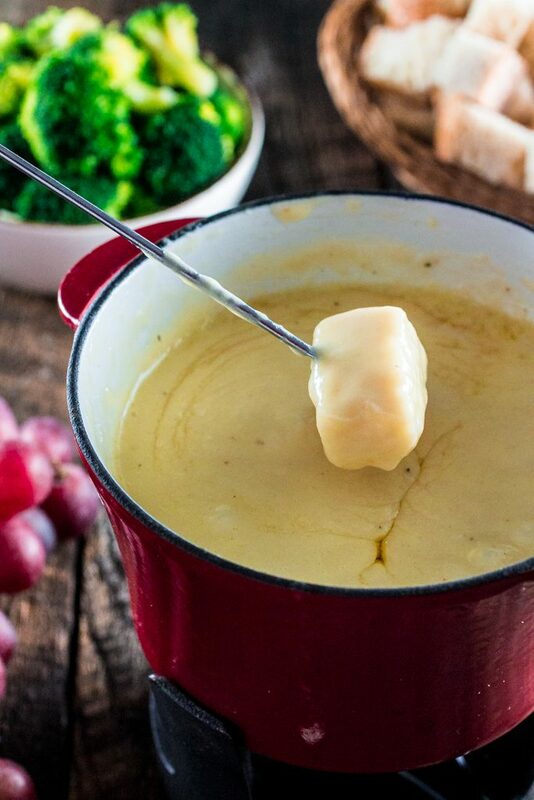 What’s more romantic and intimate than sharing a pot of classic Swiss Cheese Fondue with your loved one? You’re probably thinking I’m cuckoo. While everybody is sharing St Patrick’s Day and Easter recipes, here am I talking about love. I was supposed to share this recipe before Valentine’s Day. But the reality is that life threw me a curveball and not only I wasn’t able to catch it, but it hit me on the head and left me with a concussion for 2 weeks. That, of course, is a metaphor. No need to send the ambulance just yet! I hate using this blog – which is my happy, sacred space – to talk sad things. I’m not going to get in details of what happened, as I’m not yet ready to share, but I’m going to say that I was out for 2 weeks, feeling sorry for myself, buried in a pity hole that I dug so could hide and lick my wounds for a few days. Being the ultra dramatic sensitive person that I am, it sometimes take me longer to bounce back from funk-land. But I did it! I fought like hell against the depression that was tempting to get me to ignore life and stay under the covers watching Netflix all day, and I’m proud to report that I eventually won and am ready to resume my normal life. 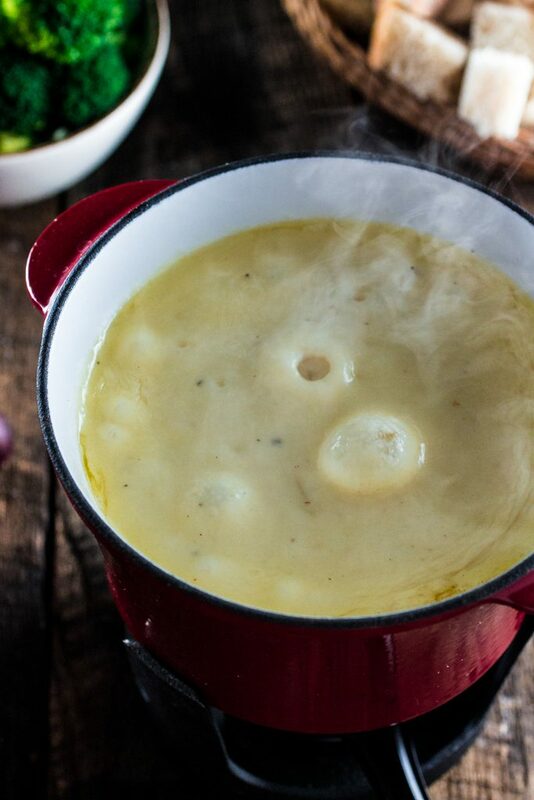 But what does cheese fondue has to do it all that? Oh, well, as you might already know, food is a huge part of my life. So it was only natural that I used a romantic dinner (that, obviously, involved an abnormal quantity of CHEESE and bread) to not only help me pull myself out of that crumminess but to also reward my poor husband, who had to deal with a not so great part of me for the past few weeks. And, yes, I am aware that winter is almost over and that cheese fondue is considered a winter dish. But be honest with me. Do you really need a season to indulge in melted cheese and crusty bread? Yep. I didn’t think so! 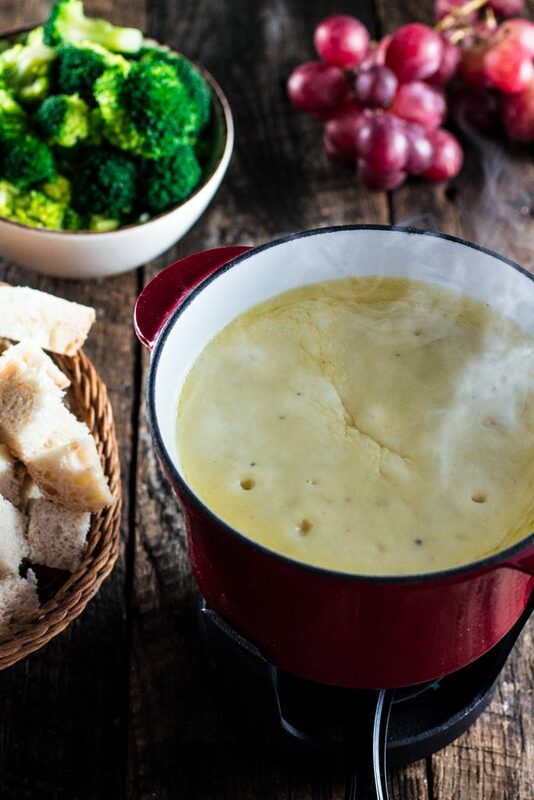 Contrary to popular belief, that says fondue originated as an après-ski snack, this Swiss classic dish dates back further than the ski crowd in European ski resorts. 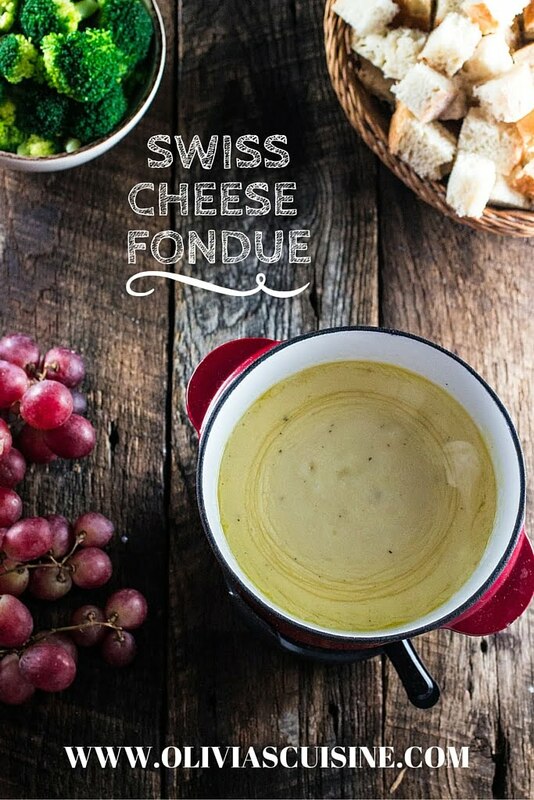 During the sixteenth century, Swiss farm families came up with fondue as a way to use ingredients in the winter that were prepared during warmer months. Melting the hardened cheese in wine to eat with stale bread seemed to do the trick and the fondue was born! And, as with every other delicious and hearty peasant dish, it eventually became sophisticated and, during the 50s, became a popular dish between tired skiers after a hard day on the slopes. In the United States, fondue’s popularity reached its peak in the 60s and 70s, when it became a staple at house parties. 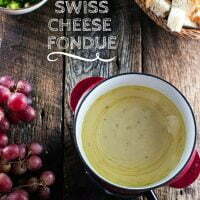 Some people believe the fondue craze had a lot to do with corruption and the Swiss Cheese Cartel. Nevertheless, fondue’s popularity ended up dying and fondue pots gathered dust inside cabinets for years. Until now! 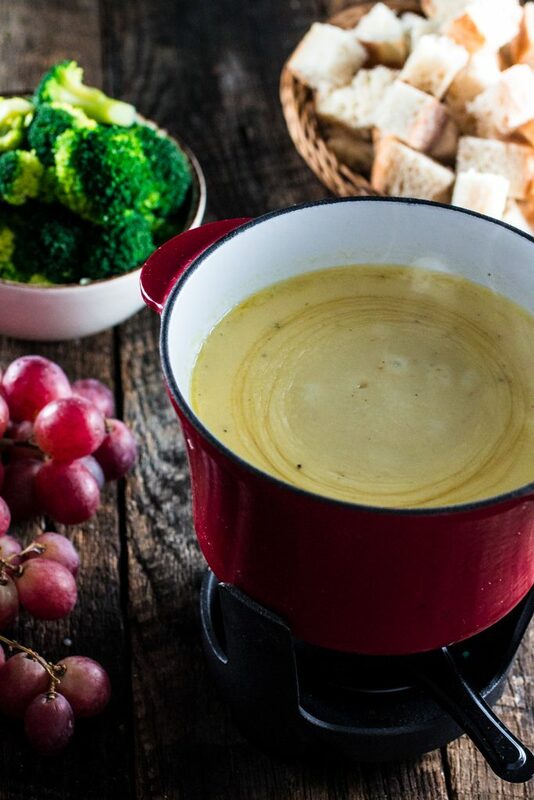 Fondue is finally becoming trendy again as people rediscover the joy of gathering around a communal dish to share a meal and enjoy the company of friends. It has also evolved to something sophisticated and more than just party food, making a great romantic dish to serve for Valentine’s Day and other celebratory occasions. Not to mention it is easy and quick to make. And you, the cook, get to eat the crust of the browned cheese that forms at the bottom of your empty fondue pot (called la religieuse). I mean, I guess you could share. I highly suggest you don’t! So what do you say? Time to dust off the fondue pan, don’t you think? Combine the grated cheese and the Mont d'Or (or Brie) in a bowl. Reserve. Rub the inside of a medium sized heavy pot with one of the garlic halves. Add the white wine and bring it to a simmer, over medium heat. Gradually add the cheese, stirring constantly until it melts, adding more wine if necessary. In a small bowl or cup, combine the cornstarch and the Kirsch, stirring until the cornstarch is dissolved. Add this mixture to the fondue, along with freshly ground pepper and nutmeg. Bring the fondue to a simmer, cooking (stirring constantly) until thickened, about 5 minutes. Rub a fondue pot set with the second garlic half. Transfer the fondue to the fondue pot and serve over a flame with the desired accompaniments. 1) Do not skip the cornstarch as it keeps the cheese and wine from separating. 2) Use good quality cheese, as the cheese is the star of this dish. Do not buy the pre shredded stuff! For easier grating, just pop the cheese in the freezer for 20 minutes! It works like a charm. 3) For a non-alcoholic version - even though the alcohol cooks off to almost nothing when simmering on the stove - just substitute the wine and brandy for flavored stock with a touch of lemon juice or vinegar to prevent the cheese from curdling. So glad to see and read that you’re back! Funk begone! This is so delicious! I just made this for the second time tonight and it was fantastic. I even made it with different cheeses and it worked beautifully! Thank you for sharing!